Greatest of advances, discoveries, inventions and innovations in science rarely follow a linear logic. A number of scientists and technologists in several spheres have beautified the landscape of science and technology-led development in India. These people personified excellence along with dedication and wisdom. What was their moment of inspiration? What made them achieve what they did? 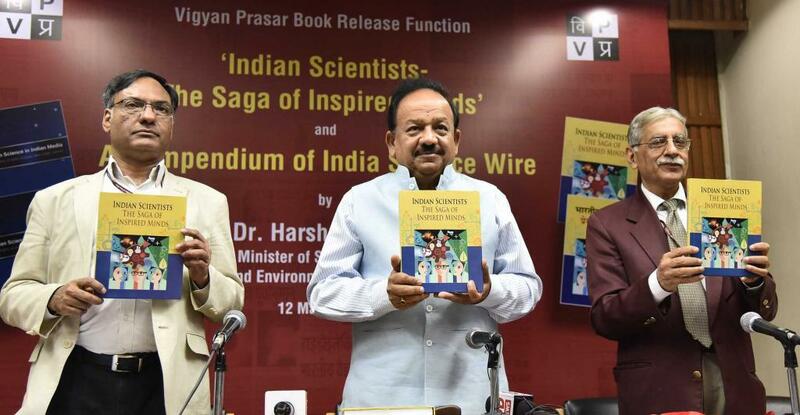 A new book, Indian Scientists: The Saga of Inspired Minds, released on Monday seeks to reveal important facets of development of science and technology from the perspective of inspiration and tenacity of purpose demonstrated by 54 of the top scientific minds of the past. The book, published by Vigyan Prasar, was formally released by Minister for Science and Technology Dr Harsh Vardhan. Family members and associates of a few of the scientists featured in the book were also present in the function. The initiative is unique as the book seeks to bring out moments of inspiration of scientists. While biographies of several scientists have been published over the years, few have solely focused on inspiring moments. The scientists featured in the book include Vikram Sarabhai, Homi Bhabha, Shanti Swarup Bhatnagar, Jagadish Chandra Bose, Satyendra Nath Bose, S.Chandrasekhar, Satish Dhawan, Salim Ali, Harish Chandra, A.P.J.Abdul Kalam, Hargobind Khurana, T.R.Seshadri, Vainu Bappu, Anna Mani and Y.Subbarow. While releasing the book, Dr Harsh Vardhan said he would request Ministry for Human Resource Development to include the book in school curriculum or ensure that it was made available to students all over the country. “The lives of the scientists figuring in the book are glowing examples of triumph over adversity which will enthuse Indian youth who aspire to embark on the path painstakingly laid by them. Citizens from all walks of life, too, will be inspired by the leadership and vision of the scientists covered in this publication, for inclusive development,” the minister said. “This publication also serves a very important purpose of science communication. It is designed to create awareness about the wealth of insights on the forms and functions of science and technology as tools for inclusive growth”, he added while reading out a few passages from the book. Dr Harsh Vardhan also interacted with associates and relatives of some of the scientists featured in the book. Those present included Mr.Kartikay V. Sarabhai, founder director of Ahmedabad-based Centre for Environment Education and son of Vikram Sarabhai; Dr Krishna Mishra, honorary professor, Indian Institute of Information Technology Allahabad, who was a research scholar of Dr. T. R. Seshadri;Dr.Tushar Purushottam Prabhu from Indian Institute of Astrophysics, a student of astronomer Dr Vainu Bappu;Arun Bhatnagar, former IAS officer and grandson of Shanti Swarup Bhatnagar; and S.P.K Gupta, biographer of Y Subbarow. On this occasion, the minister also released a compendium of science news articles syndicated by India Science Wire (ISW) during 2017. The compendium included 425 original news stories in English and Hindi produced by India Science Wire and published in Indian media outlets. These news articles highlight some of research work done in Indian research laboratories, academic institutions and universities. Another compendium of research highlights of winners of Ramanujam Fellowship awarded by the Department of Science and Technology was also released.